Social media regularly feature neatly designed images, with facts and figures on a range of topics. 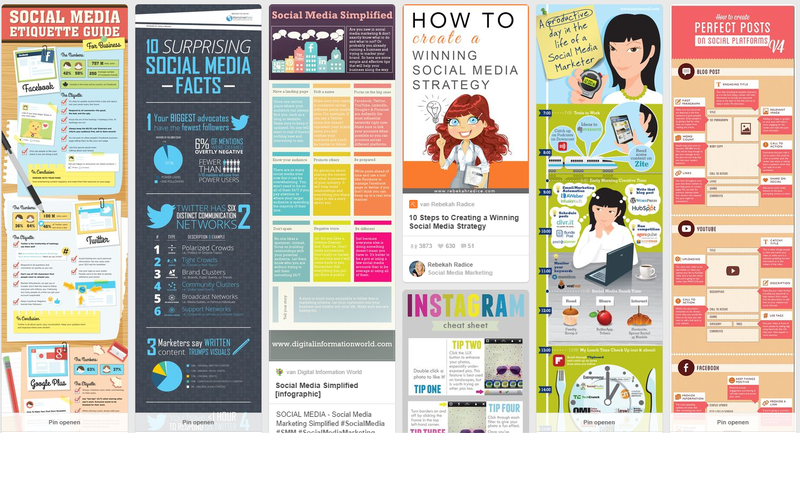 These ‘infographics’ invite reading and sharing – just what a social media manager wants! Many companies now decide to communicate facts and figures through images, because they speak louder than words. People are visually sensitive, and find images more appealing than long pieces of text. So, what is an infographic, and how can you make your own? Read on to learn how you can, and why you should. … nothing more than a visual representation of information, summarized data, facts and figures contained in a graph or image. The key to success are the short catchphrases and the graphic design. It is therefore important to make the infographic fit the main message you want to communicate: the information in the image must be relevant. For instance, an infographic is well-suited to provide a visually attractive overview of a company’s followers and fans on Facebook, Twitter and other social media. It could also represent successful or less successful content: which tweet got retweeted most often, which post received negative engagement? The number of potential topics for infographics is infinite. An infographic containing a small set of ‘nice-to-know’ facts will draw readers’ attention. Many readers do not have time or inclination to read (longer) textual articles online, and they will be inclined to select a visually attractive post on social media instead. An attractive header can persuade the reader to click your post, and read it. Moreover, infographics can be saved in JPEG or PNG file format, which allows readers to paste it onto Tweets, or to add it to status updates on Facebook. Images stand out on the Facebook timeline, and attract more clicks than ‘regular’ posts. The key strength of an infographic is that it communicates all desired information in one glance. The core of your message is emphasized by colours, numbers, arrows, terms or catchphrases. You can design infographics in your organisation’s branding: use its logo, font, prefered colours, and style. If you regularly publish infographics with information tailored to your customers’ interests and needs, this can quickly enhance your online presence. Moreover, your infographics can easily be shared on various social media channels, such as Facebook, Twitter, and Pinterest. Visually attractive infographics that contain strong messages are shared more often and more quickly online: links in the posts will certainly generate traffic. How to create an interesting and effective infographic? Data and design are the two key ingredients for an effective infographic. First, collect suitable data; second, select the data for use; and third, visualise this data in an attractive and concise infographic. • Make it shareable. For the widest reach, make your infographic shareable by its interesting and original content in a neat design. • Strengthen the content with colour: Does the infographic mention Facebook and Twitter? Then the colour blue is effective. Make colours fit the content of your message. • Make sure you can use your own, original data for an infographic in your company’s branding. • The infographic is one unit of information. Keep in mind that its style should be unified to fit. Make sure all parts are aligned, one font is used throughout, and colours match. 1. Mistake in selection of the available data. Make the best selection from all data you have available; let your message be clear and concrete. You need a clear plan for the message you want to communicate. Good data must always be followed by a good story: note that there is a difference between collecting data and selecting the information to tell a story in graphic design. A data expert is not a story teller! Separate key points from details: what’s your infographic’s main message? 2. No clear target audience. Specify a clear target audience beforehand, possibly by using a persona to portray the audience in more detail. Targeting a specific audience makes your infographic more interesting. Infographics do not even always need to contain positive messages: they might also suprise or amuse, as long as they do so clearly and convincingly. 3. Misuse of images and graphs. Always use images, graphs and charts properly: select the best-fitted ones and don’t suit yourself with particularly good-looking examples that you have seen in a completely different branch or on another topic. Graphs must always suit the content in your infographic. 4. Mind the design: beauty and effectiveness are two different things in the world of infographics! You can use several available online tools for the design (see below). Select the forms and colours to match the data you wish to communicate, and keep your message and target audience in mind. 5. Mind the infographic’s goal. The infographic is a group effort of several people: a data collector and selector, a graphic designer, and a marketeer, who makes sure the infographic will reach its goal. A more extensive article on common errors and challenges can be found on Frankwatching [DUTCH]. Besides these free tools, licensed software may provide more range for your own creativity and design. Use, for instance, Photoshop for editing images, InDesign for the design of the infographic, or Illustrator for creating shapes.